What cocktail to offer on Independence Day, the day some of the greatest political minds signed the document outlining the most secure and fair methods of governance, formally and with uncommon eloquence and foresight, and obliterating all ties with Great Britain? Happy Fourth of July, with hopes that our current and future leaders will have the intelligence and will to sustain our Founding Fathers’ vision. 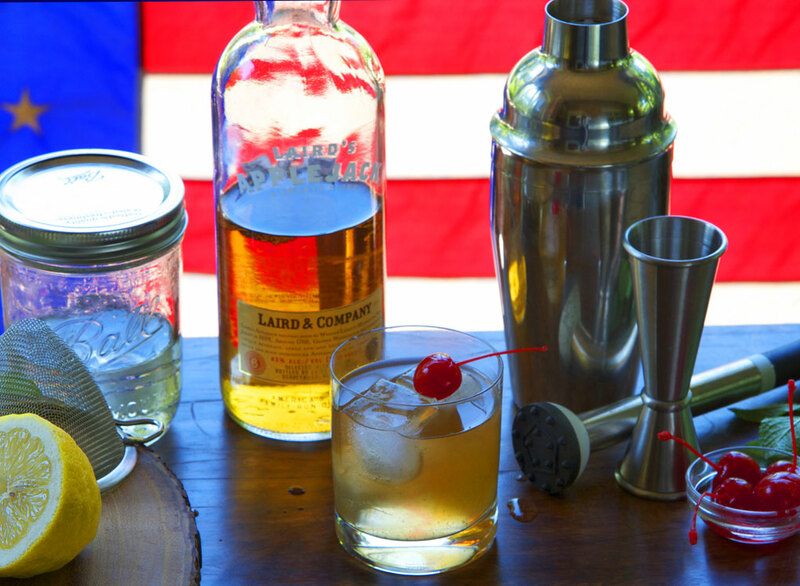 Smash the mint in a shaker (or for a very minty drink, using a mortar and pestle), then add the Applejack. Ideally, let the mint steep for 30 minutes or so. Add the lemon juice and simple syrup to the shaker. Fill the shaker with ice, and shake hard to further smash to the mint. Pour over ice in a rocks glass (through a strainer if you have one). Garnish with a cherry. My past cocktail posts on the Rye Whiskey Smash, Ludwig, and Basil Gimlet. The New York Times shares the history of the Laird family. Learn about Calvados, an apple brandy from Normandy. Here is a list of other smash cocktails recipes from the Boston Globe. 7 Wonderful responses to “Happy Fourth of July! My first visceral reaction to Calvados was “what the? ” and then I remembered that without the French, we would not be celebrating independence today. If you use Luxardo maraschino cherries, they’re worth eating (but they are not American). I’m willing to put using them under the rubric that the U.S. is a country of immigrants. Ruhlman, you need a good cat to protect your cherry crop. I make a large batch of bourbon cherries when they are peak season. Use them in Manhattans, and the liquid ( bourbon and sugar) is a great addition to many cocktails. I think Applejack is one of the great American spirits and I’m all for creating new cocktails in which to use it, so I thank you for this smashing Smash. Shake well with ice and strain into a chilled martini glass. Garnish with a lime wedge. and very good on a warm summer evening. I tried this as written and had to throw it out (and it takes a lot to make me throw out a drink). I didn’t use a mortar and pestle, but smashed up the mint pretty thoroughly in my shaker, then let it steep, then shook it hard. Not only was the mint overwhelming, but it was awfully bitter. Like really bad toothpaste. I’d always read to treat mint gently, so that’s what I’ve done in the past, and what I’ll do in the future. I highly recommend using Laird’s bottled-in-bond straight apple brandy, rather than the Laird’s Applejack. The straight apple brandy has a more pronounced apple flavor than the applejack, which is a mix of 35% apple brandy and 65% neutral spirits. The brandy is also 100 proof, which makes it stand out a little more in cocktails. delivering the following. unwell unquestionably come further formerly again since exactly the same nearly a lot often inside case you shield this increase.